Hiking is one of our pack’s favorite activities! Hiking with your dog has many benefits – for both you and your pup. Exercise: Regular exercise for your dog is a necessary daily activity to keep them in-shape and healthy. 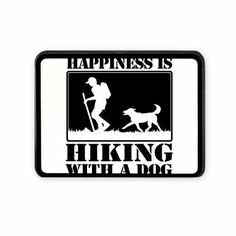 Bonding: Dogs love to be with their humans, and hiking together can strengthen the bond between you and your dog. I can think of nothing better than getting outdoors with your best friend(s) to explore the wilderness! Variety: Walking on a trail provides different smells and surfaces – and to a dog, that’s very stimulating and exciting. “A tired dog is a good dog:” A good long hike will surely tire your dog out. This can prevent destructive behaviors at home like digging and chewing. Socializing: Your pup is likely to meet other hikers and dogs along the trail. Exercise: Keeping in-shape and being healthy is just as important for you! When hiking in a beautiful wooded setting, it doesn’t even seem like exercise! Rewarding: Reaching the top of a peak, or the end of a challenging hike is gratifying, and can produce a great sense of accomplishment! Track your hikes on MapMyFitness, both online and through the app on your phone so you can look back at you and your dog’s accomplishments. Reduce Stress: Walking gets your endorphins flowing, which will distract you from your daily worries. Photo Opportunities: Like to take pictures? You will have countless opportunities to take many breathtaking shots! Solitude or Socializing: Hiking can offer a chance to get away from it all, or can be a good way to spend time with family/friends and their dogs, or a chance to meet new people and dogs. There are also many cubs that offer hiking “meet-ups” so you can hike with others if you choose. Is your dog physically ready? Make sure your dog is up-to-date on shots and vaccinations. Make an appointment with your vet to be sure your dog is healthy enough to hike. Ease your dog into the routine of hiking. If you want your pet to wear a backpack, have them wear the pack around the house, then on short walks, then longer walks. You should also start with lighter loads. It’s safe to eventually work to up to one-third of your dog’s weight if your dog is in healthy physical condition. Identification: Be sure your dog is microchipped, or has proper identification tags that are visible, and easily readable. Find the right trail: Make sure your hike is in an area that allows dogs. Do your research, and familiarize yourself with any restrictions such as which areas of the parks that do not allow dogs, and whether they have to be leashed at all times. Also check hunting rules for the area you chose. You and your pooch may need to wear blaze orange to be safe. Not sure where to start? Click HERE for some dog friendly trails! There are also many books available that offer dog friendly trail suggestions. 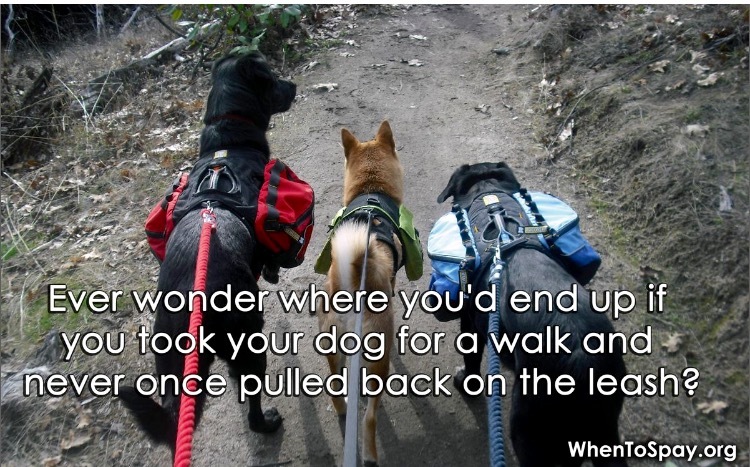 Backpacks: Backpacks are a great way for dogs to burn extra energy during a hike and give them a sense of purpose. Younger and healthier working-type dogs can carry up to 25 percent of their body weight. However, for most dogs, 10 to 15 percent is plenty, which is usually enough for them to bring along their own water and snacks. You should always consult your vet before taking your dog on a long hike with a full backpack. Keep your dog on a leash: Never take your dog off-leash even if it’s allowed, because too many things can go wrong. Even the best-trained dogs can ignore voice commands, or “break through” an electric collar and race after a squirrel or deer through bushes or shrubs, which can be dangerous to the dog, and damaging to sensitive off-trail habitat. Be aware of wildlife in the area: Coyotes can attempt to lure away small dogs so they can be attacked by the pack. Deer, despite their non-aggressive personalities, can cause serious damage by kicking with their back legs. Snakes are more afraid of us then we are of them, but will strike if they feel threatened. A snake-bite kit is a good thing to add to your hiking first aid pack. If there are bears in your hiking area, you and your pup can were bear bells to keep the bear at a distance, and carry bear mace for extra protection. First Aid: Bring basic dog and human first aid supplies like gauze pads, bandage tape, topical disinfectant, tweezers (for ticks). Keep your vet or emergency vet’s phone number on speed dial. Foot- pad protectors in the form of boots or protective wax are a good idea for dogs with sensitive feet. Hydration and Nutrition: Pack a collapsible bowl, or water bottle designed for dogs. Dogs get dehydrated much faster than humans do, and need to have water offered to them frequently during a hike. Dogs like to drink out of creeks and lakes, but they can get a parasite from the water, which can make your dog very sick. Don’t feed your dog a large meal immediately before or after a hike, and be sure to supplement treats throughout the hike. Poop Bags: Bring PLENTY! Practice “Leave No Trace” ethics, and clean up your dog’s waste. Pack it out with you in plastic bags. Dog waste contains bacteria, which can cause disease and pollution when left behind. Don’t assume that every hiker and dog you meet on the trail will like your dog. Be sure to keep your dog well controlled so that other hikers and dogs don’t feel frightened or threatened. Also, don’t assume that other dogs you might meet on the trail are friendly, even if they are wagging their tails. After your hike: Thoroughly check your dog for cuts or injuries as well as ticks, which can carry Lyme disease. Dogs burn energy faster than humans, so keep some healthy treats handy so your dog can have a little snack before you head home. Keep these important items in mind before and during your hike, and add to this list what you think is important after your first few hikes with your dog. The FitDog Friday Blog Hop is brought to you by SlimDoggy, To Dog with Love and My GBGV Life. Join the Hop or just enjoy the links below – lots of fun fitness tips and advice!